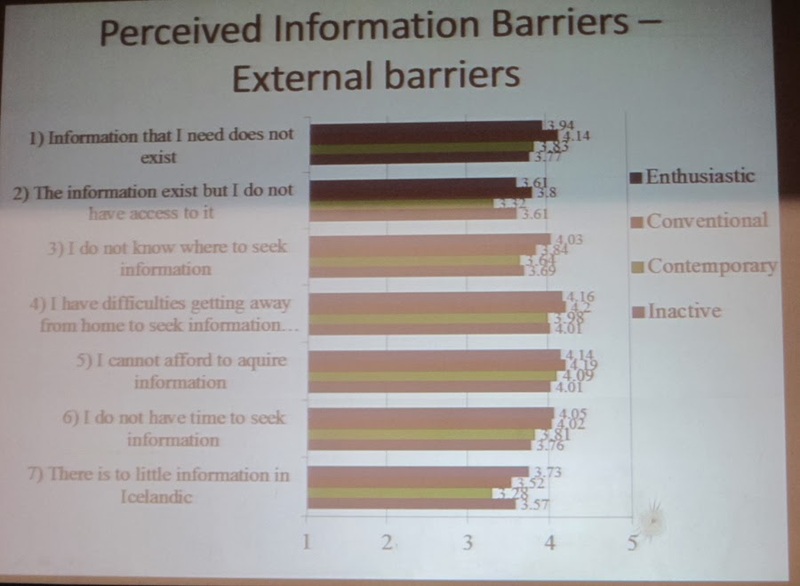 The penultimate talk in a session on workplace/ everyday IL, was Perceived Barriers in Relation to Health and Lifestyle Information among Icelanders by Ágústa Pálsdóttir at the European Conference on Information Literacy. I am afraid that I was by now feeling a bit weary, since the day started with my workshop (which I will blog later) and then a poster session (which I also participated in) and then a rather long session (and no lunch until 3.15pm!) Therefore I am unlikely to do this speaker justice. The speaker was reporting on a study carried out in 2012, with a sample of 1200 Icelanders, which used a questionnaire to ask about information seeking. The respondents were categorised into enthusiastic, convential, contemporary and inactive searchers. There were some barriers which were very problematic to all of them i.e. difficulties getting away from home to seek information and cost of acquiring information. Overall, external barriers were seen as more problematic than internal ones. The barriers found most problematic by everyone was that it was difficult to find information with good advice about health protection, followed (I think) by information being hard to understand. The extent to which people experienced barriers varied with the categorisation.